I have a delicious and fabulous recipe to share, but I realized as I was putting together the pictures that I never wrote about the fifth anniversary gift I gave Chris, which is crazy considering how much I love it. Thus, the recipe is going to wait until tomorrow (although you’ll get a little ingredient sneak peak now) so I can ramble on and on about the awesome gift I gave Chris (way back in May). You may remember we had decided to actually give each other gifts (which we never do) and to go the traditional route which, for fifth anniversaries, is wood. I knew instantly that I had to get my chef hubby something to cook with and for a while I thought that it would be a really nice wooden bowl. Since I’m all about supporting local artisans and wanted something unique, I looked exclusively on Etsy for gifts, where I stumbled on Rustic Craft’s cutting boards and completely forgot about anything else wooden. Rustic Craft is amazing. It’s a husband and wife (with a little girl not much younger than Nora) who live in Fitchburg, Mass. 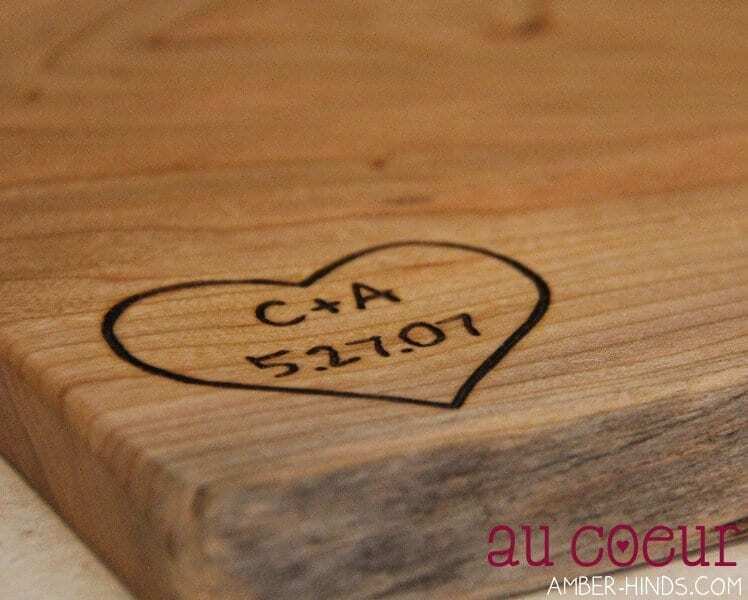 and hand carve cutting boards, tables and other beautiful wooden things. Their prices are incredibly reasonable and perfect for our budget, even given the obvious heart and effort put into each piece. I love that all of their work highlights the natural beauty of the wood and each piece is truly a work of art, right down to the packaging. Sam (the wife) was super friendly and awesome to work with. They didn’t have any information about engraving up, but I sent her a message through Etsy with a picture of what I wanted (a heart with our initials and anniversary date, sort of how I envisioned it might be carved on a tree) and she quickly responded that they could do it, even sending along a proof. Turn around time for the custom work was speedy and when it came in the mail, the engraving was even better than I had imagined. I couldn’t have been happier or more excited about Chris’ gift and he loved it too. 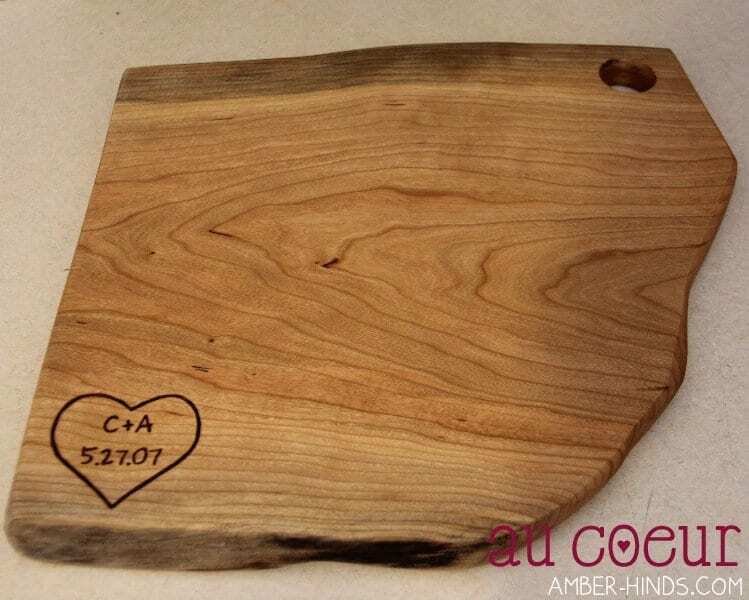 (Although he did say he may use it as a serving board more than a cutting board because it’s so beautiful!) Which basically means I’m the best wife ever and I win. If you have a chance, please go check out Rustic Craft’s website or Etsy shop and like them on Facebook. Rarely do I plug businesses or products on here, but I don’t think I’ve been happier with a purchase from such a great small business, so I had to write them an adoring blog post. I’m not being compensated for this review; I’m just sharing my joy with you. Oh WOW!! 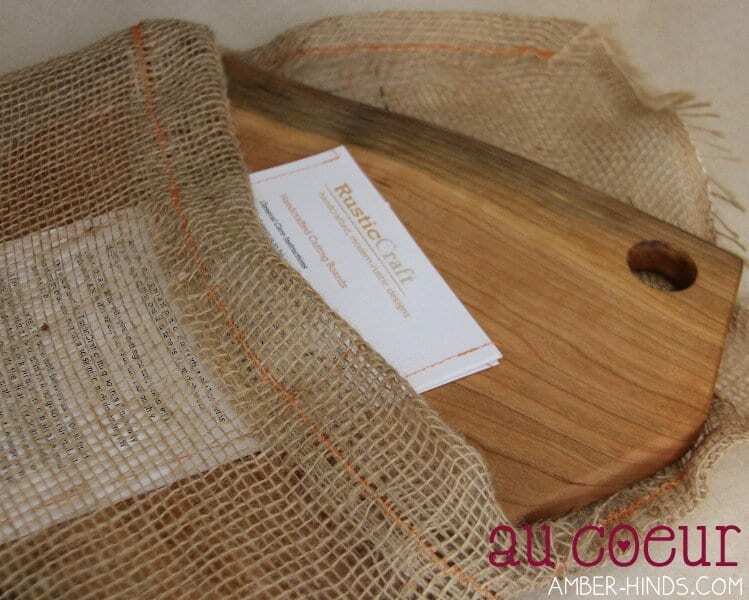 Amber thank you so much for this incredibly beautiful story (with awesome photos) about our cutting boards and shop =D It is thanks to YOUR request for an engraving that i was inspired offer engravings full time in our shop—and it has become so popular!! 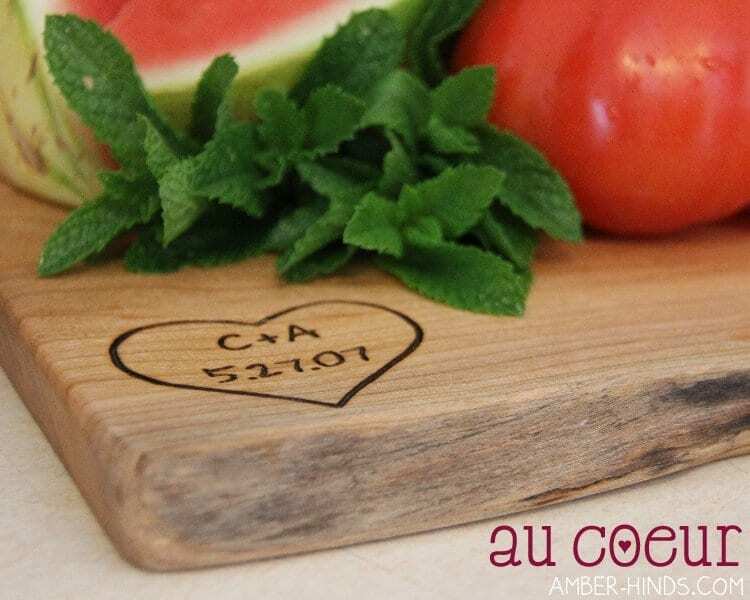 I couldn’t love doing anything more than creating custom personalization on our cutting boards—sharing such a special part of such special gifts <3 <3 I am so grateful for your request…and this incredibly thoughtful blog post just puts my gratitude over the top! I can attest to the fact that Sam is an awesome person and one true to her word. She even helped me, well, wrote me a resume that landed me a great job. I can assure anyone that everything she does she does to the fullest.